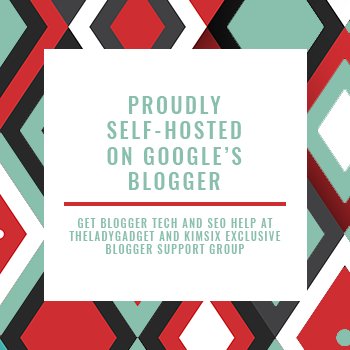 Note: This is a sponsored conversation written by me on behalf of ABSCos. In return for my time and creative effort, I'm being compensated financially for this post. 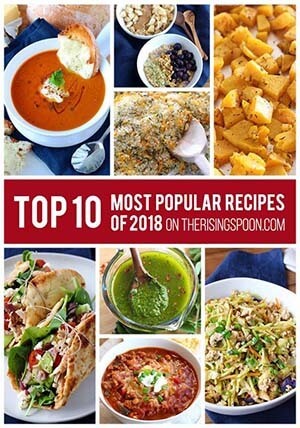 Thank you for supporting brands I partner with so I can keep creating great content here on The Rising Spoon. As always, the opinions expressed here are 100% my own. Are you ready for a makes-you-want-to-lick-the-plate-clean recipe that doesn't take a bazillion hours of prep? Something you can whip together on a Wednesday night when you want easy comfort food OR on a Saturday when you're entertaining guests? Say hello to these parmesan crusted chicken cutlets. They've got pretty much everything you need in a comforting yet fancy-pants main dish. Lots of salty, melty cheese? Check. Bright citrus zest + juice? Check. Butter + Fresh Garlic? (Perfect Combo) Check. And unlike other parmesan crusted chicken recipes, this one doesn't use any breadcrumbs (panko is popular) and is baked in the oven instead of fried on the stovetop. That means your friends who are following grain-free & low carb/keto lifestyles can partake in the food without any extra work on your part (no special ingredients needed). Also, breadcrumbs tend to fall off or burn easily in oven-baked crust preparations like this, so leaving them out definitely makes sense if you're not frying. And no breadcrumbs mean more cheese. Can't complain about that, right? Plus, my version has a QUICK lemony garlicky butter sauce that you'll want to eat by the spoonful! Win/win/win. To make this parmesan crusted chicken, all you need are a handful of simple pantry + refrigerated ingredients (see pic above). However, chicken is the star, so I highly recommend seeking out the best quality you can get. When it comes to buying boneless skinless chicken breasts (and their various cuts) from local grocery stores, my favorite, by far, is Air Chilled Chicken. I've asked numerous butchers what they recommend in years past and it's always this! 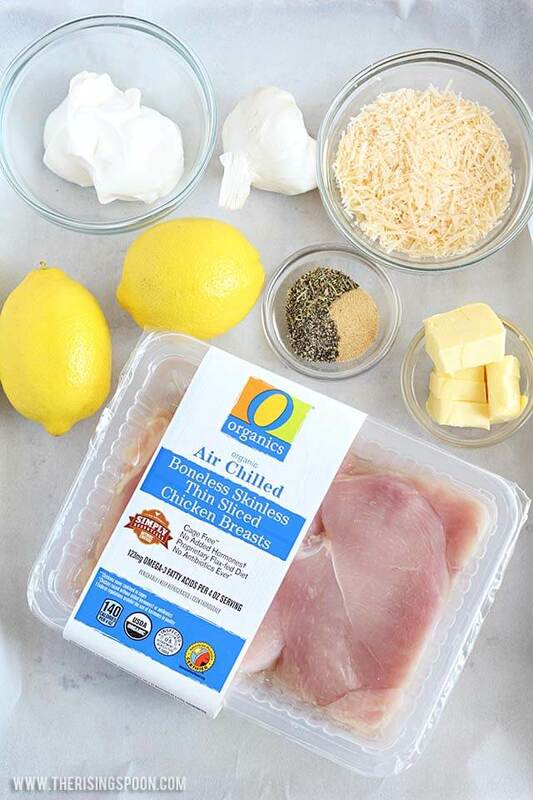 I especially love the Air Chilled Chicken from O Organics® (featured in this recipe) because they're packaged in a way that preserves freshness. That means I can buy 2-3 pounds of chicken a few days ahead of time without worrying it will spoil too soon. It's individually processed in cold chambers with purified air, which results in intensely flavored chicken. The meat is higher in Omega-3 fatty acids from a 100% organic flaxseed-enriched feed that supplements the chickens' diet. 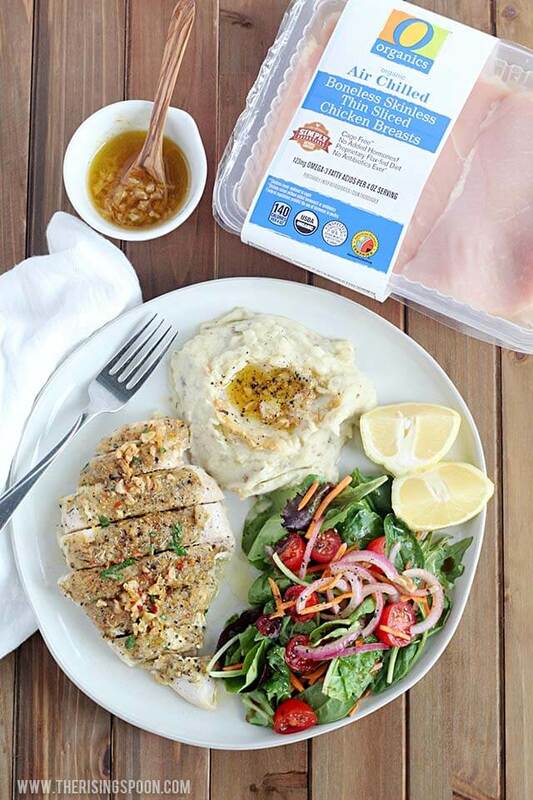 However, for my foodie friends in other states, you can also find this chicken at other Albertsons Companies grocery stores like ACME, Shaw’s, Star Market, Jewel-Osco, or Randalls. 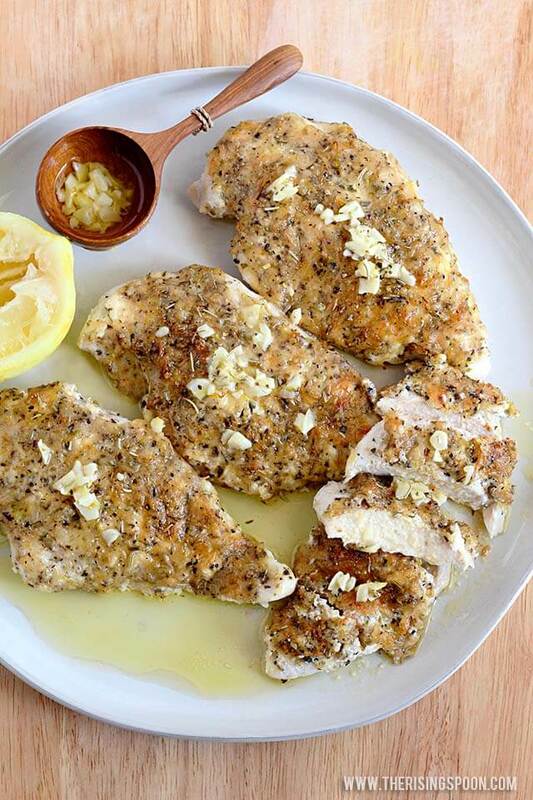 If you're not sure if you have a store close by, visit the Tom Thumb website to search for the nearest store nearest to you and check out more chicken recipe ideas. As he sat there snarfing down bites with a smile on his face, I sat across from him thinking: "This chicken looks SO simple. I could easily make it at home". And I almost did. Just as he ate it at the restaurant. Fried on both sides so it was super crispy, laid on top of chopped artichoke hearts & sun-dried tomatoes, then served with a side of lemon butter sauce. But, I'm lazy about frying things and didn't want to go through the many repeat steps of dipping, breading, and frying the chicken. It's messy and rarely worth the effort to me, birthdays being the only exception. So, I took inspiration from the many parmesan-panko crusted chicken thighs and sour cream + mustard coated fish filets I've baked in years past, and came up with a version of parmesan crusted chicken cutlets that's all about the cheese and buttery sauce with way less work, fewer ingredients, and no frying involved! And it'll still make the chicken lovers happy. The key ingredient here, which you might think sounds weird, is sour cream. It acts as a barrier to protect the lean chicken breast in the oven so it stays moist and doesn't dry out. Lots of folks actually coat their lean meats (pork chops is another example) with mayonnaise, buuuuutt...a big ol' GLOP of mayo on my chicken? Well, if I'm being honest, that just grosses me out. Sour cream, on the other hand, I could eat that in dip aaaaalll day long, so it makes total sense. Even if it still sounds weird, just try it at least once. I promise you can't taste it! I don't know about you, but anything involving butter & garlic makes me instantly want mashed potatoes (or mashed cauliflower "potatoes" if you're sticking to low carb). Pasta like fettuccine, linguine, and spaghetti are also a popular choice for parmesan chicken meals. I'm just firmly in the mashed potato camp since pasta can easily overwhelm the chicken, while the taters just compliment it. Looking for more chicken recipe ideas? Check out my chicken recipes index. Preheat oven to 400 degrees. Measure the parmesan and sour cream into separate bowls. 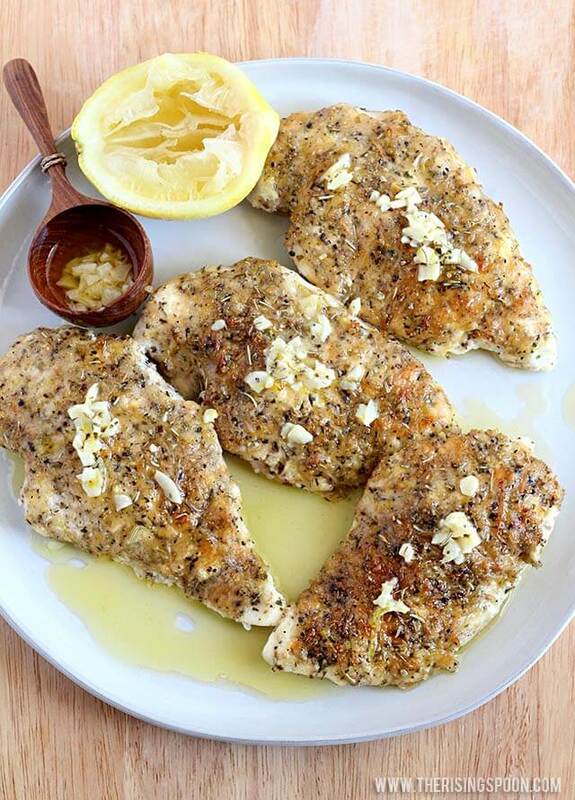 Zest the lemons, reserve ½ teaspoon of zest for the sauce, and stir the rest (about 2 ½ teaspoons) into the parmesan, followed by the Italian seasoning, granulated garlic and ½ teaspoon of black pepper. Stir juice from ½ a lemon into the sour cream (about 1 tablespoon) and set the second half aside for the sauce (slice the other lemon into wedges for garnish). Rinse and dry the chicken, trim any visible fat, place the cutlets in a large plastic zip-top bag and seal well. Gently pound the chicken using a cast-iron skillet, rolling pin, or meat mallet until all pieces are a uniform ½ inch thickness, then lay flat on a baking sheet. 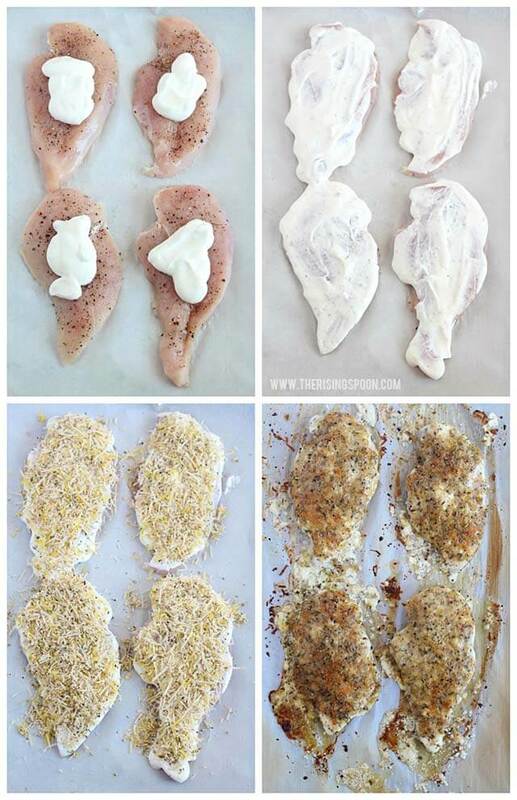 Sprinkle the chicken evenly with ¼ teaspoon of sea salt and black pepper, then spread 1 tablespoon of sour cream across each piece. Sprinkle the parmesan mixture evenly across the top of the sour cream layer until it’s all used up. Bake the chicken for 15 minutes OR until the thickest part of the chicken breast registers 165 degrees with an instant-read thermometer. If your chicken is thicker than ½ inch, it may take 17-25 minutes. If it's thinner, check it at 10-12 minutes. Optional: To brown the parmesan cheese topping and make it slightly crispy, turn the broiler to the high setting and place the chicken back in the oven for 1-2 minutes. Any longer than that and they may overcook. 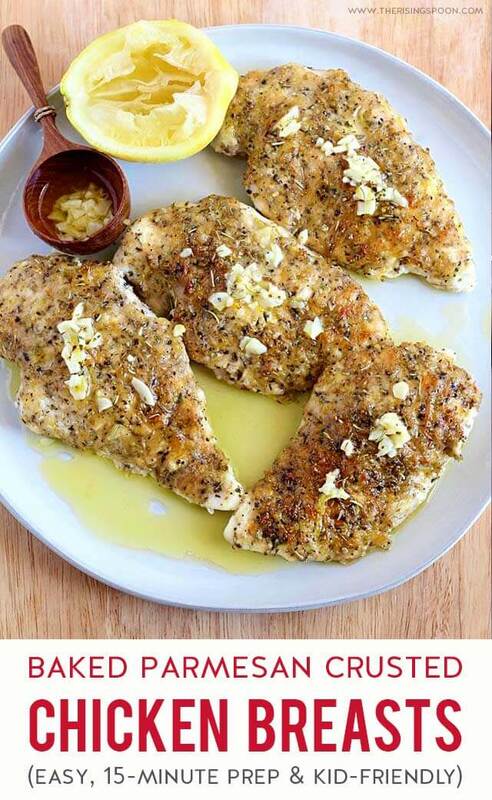 To serve, slice the chicken into strips, drizzle generously with the lemon garlic butter sauce and garnish with crushed red pepper flakes (optional) + extra lemon wedges. While the chicken is baking, mince the garlic and add the butter to a small saucepan. Melt over medium heat. Once it starts bubbling, cook the butter, stirring constantly, about 2-3 minutes. Add the garlic and cook 30-60 seconds or until fragrant. Remove the sauce from heat and stir in the lemon zest + juice from the remaining half lemon. Set aside to let the flavors develop until the chicken’s ready. If the sauce solidifies by the time you serve the chicken, reheat on low for 1-2 minutes until melted again. If you’re in a hurry you can skip the pounding, but it helps to ensure the chicken cooks evenly so you don’t have one end juicy while the other is dry. 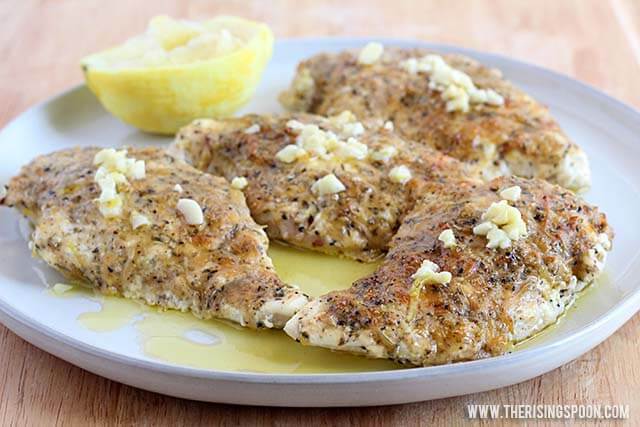 If you like thicker chicken or you’re using big pieces of whole chicken breasts instead of cutlets, you can flatten them to ¾ inch or higher but this will increase the cooking time. The important thing is keeping them a uniform thickness so they cook evenly. For easy clean up, bake the chicken on a layer of parchment paper or foil; however, if you plan on broiling the chicken at the end, keep in mind that parchment paper burns quickly. Note: Thanks so much Kristen Ethridge and Allie Barnes for graciously offering to recipe test this dish for me and providing feedback. 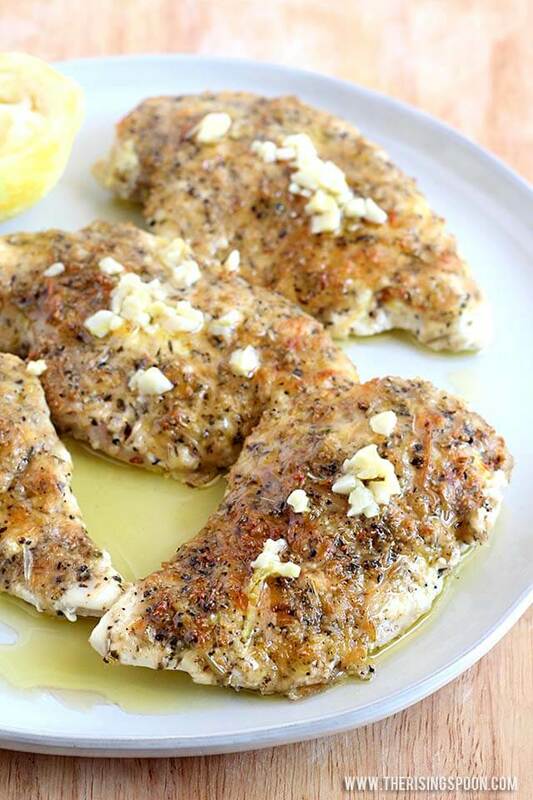 Click Here To Pin This To Your Chicken Recipes Board On Pinterest!